As a follow-up to the groundbreaking Vinyl Will Kill! book, Sydney wunderkid Jeremy Andrew - aka Jeremyville - presents a brand new book project with IdN - The Jeremyville Sessions! 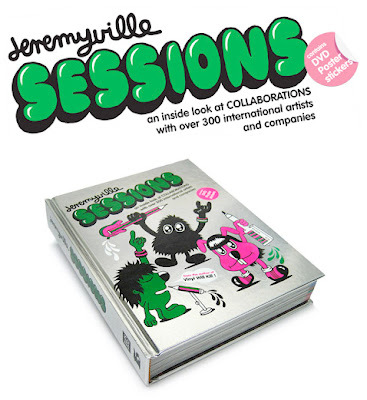 The Jeremyville Sessions focuses on the rise of collaborative projects as the new art movement of the 21st century. With the rise of internet communication and technology, disparate designers from all over the world - folks that would otherwise never have worked together - are able to creatively share ideas and projects. Using his own experiences as a case study, Jeremyville showcases collaborative projects that he has worked on with over 300 artists and companies - covering a variety of mediums from original art, apparel, animation, toys and more.